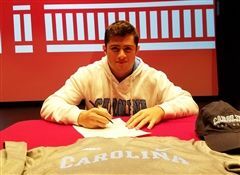 Today, senior Michael G. signed his National Letter of Intent to wrestle at University of North Caroline Chapel Hill. Time for our fall sports roundup! MS Sports Update: A Win in OT! With outstanding defense, forced turnovers, and some key shots, the 7/8 grade girls varsity basketball team pulled off a 20-19 win in overtime yesterday against Lainer! Yesterday in boys varsity golf, junior Jared B. advanced to the Regional State Qualifier for the Southern California Golf Association - farther than any other golfer in the team's history! Our Buckley Lower and Middle School Athletics teams concluded their seasons prior to Thanksgiving break. As always, fall season was filled with excitement, heartache, nail-biting finishes, and championship wins. We fielded 16 teams in girls basketball, flag football, swimming, girls tennis, and cross country, and participated in both the Delphic and San Fernando Private Schools League. Boys varsity soccer, girls varsity basketball, and sixth grade boys red basketball team have all made impressive playoff runs this winter season. 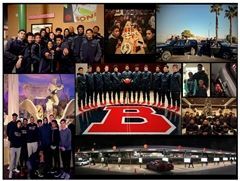 Last week Buckley's varsity boys basketball team went 3-1 in the Las Vegas Invitational last week. The team took fifth place in the tournament as they defeated Chadwick School 58-36. Captains Paul B. and Kanoa J. averaged over 16 rebounds per game. Freshman Shawn W. was named all-tournament after posting scores of 18 and 20. The team will take on El Camino Real this Friday night at 7:30 p.m. at home. Not only did our boys do well on the court, they also did visited Hope of the Valley Rescue Mission last Saturday where they prepared lunch, to-go bags, and donated blankets and jackets to go to the homeless in the San Fernando Valley. "This is a terrific and wonderful group of young men," said Head Coach Mike Hamilton. "Please congratulate them if you see them. I know they don’t smile much, that’s just their tough look! They are really funny kids." 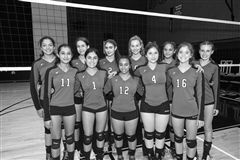 Head coach Juliane Piggott and the girls on Buckley's volleyball team are shaking up the program like never before. 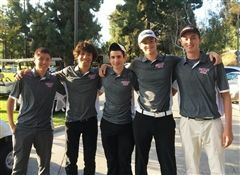 This year, the boys varsity golf team became the second golf team in the school’s history to qualify for the state team tournament. With a record of 8-5, this is the ninth straight season with a winning record. Find out more about our co-athletic director, Fraser Allan. Learn more about Middle and Upper School swim coach (and National Champion) Keri Hehn. Want to know more about Coach Russo? Click below to read more!